The five pieces in this cycle narrate episodes from the military deeds of the Carthaginian general Hannibal. The scenes feature spectacular figures of people and animal framed by a wide border of 50/55 cm depicting fruits and vegetables. Several Latin inscriptions in a banner in the top part recount the events. A series dedicated exclusively to Hannibal is unusual. The Carthaginian hero generally appears with his enemy, Scipio Africanus, who, as the victor of the war, becomes the main character in the tale. In this series, however, the only protagonist is Hannibal and his victories. The series was probably composed of eight pieces, five of which are kept in Zamora: ‘Hannibal’s Oath’, ‘The Crossing of the Alps’, ‘Hannibal in Italy’, ‘The Plunder of Cannae’ and ‘Mago, Hannibal’s Messenger in Carthage’. 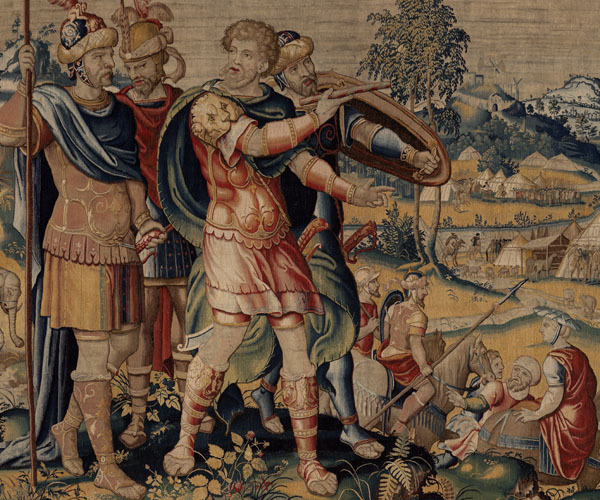 A sixth tapestry kept in the castle of Chaumont, ‘The Taking of Saguntum’, was part of a replica of the Zamora series. 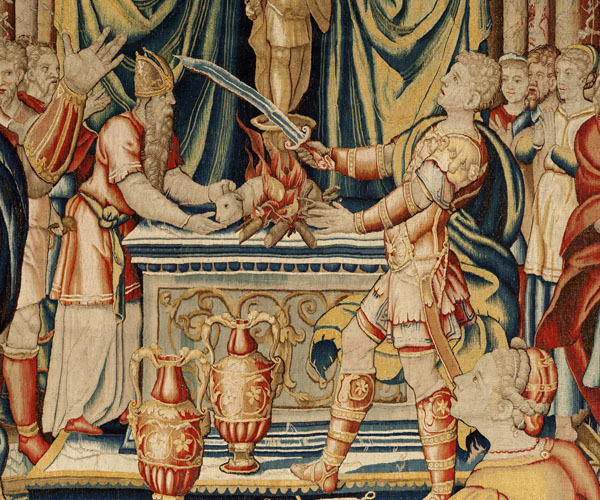 The tapestries were woven in Brussels, as shown by the mark B▼B on the selvage. The mark of the weaver is also there but has not yet been deciphered. We know that the weaver worked in the late 16th century and that he worked together with the weaver François Geubels, because his mysterious mark appears next to Geubels’ in the History of Romulus and Remus series kept in Vienna. The author of the cartoons has not been ascertained either. He was most likely an Italianized painter from the Netherlands, probably from the circle of Michel Coxcie. Despite a certain lack of expression, his shapes are monumental and rich in colouring. The style of the border, with its figures inserted among the vegetables and fruits, suggests a date of around 1570 for the series. There is no precise documentation about the date of entry into the Cathedral of Zamora. 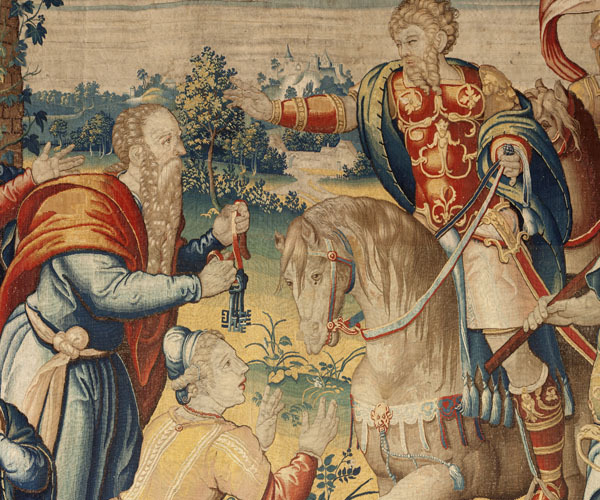 It has been thought that the series belonged to the precentor Jacinto Varas y Vázquez, who presented the cathedral with eight ‘historical tapestries’ in 1772. 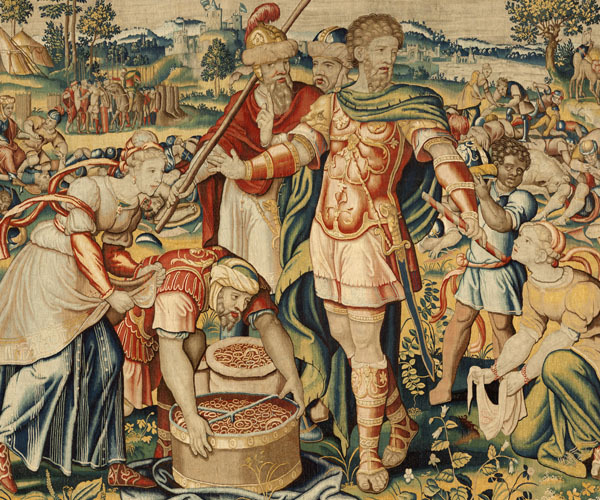 However, the cycle could have been there since the early 17th century, since ‘twenty tapestries of fine wool telling of ancient history’ were documented in 1620.